This week marks the end of the ninth full year for this column. It was also a busy twelve months for Cape Region golf. January—Long time golf professional John Wallett sums up his feelings about his career in the Cape Region in simple terms: “I never wanted to work for a living, and I’ve been lucky so far.” Area golf superintendents describe their off-season projects, critical for their club’s success when the weather’s warmer. A new edition of fake golf rules brings a smile or two. February—The Rookery’s Butch Holtzclaw has some straightforward advice for winter golf: “Go south.” Pete Oakley tries his luck at Champions Tour events. Golf shop owners Ed Larkins and Brett Marshall chat about new equipment lines for the upcoming season. March—I discuss some of the ways Cape Region golfers can improve their physical fitness, complete with a guide to the inevitable golf injuries. This year’s early adoption of Daylight Savings Time has its effects on Cape Region golfers, including the opening practice sessions for the Cape Henlopen Viking golf team. Joe Romano of Clubhouse Golf begins a Silly String donation program for our troops in harm’s way. The Vikings begin their 2007 season with a loss to Caesar Rodney, a win over Delmarva Christian, and a match-play loss to Salesianum. April—Cape Henlopen High’s golf team starts the month with a pair of victories, including a match against Dover at Kings Creek CC and an away win against Indian River. They follow that up with five more wins, over Lake Forest, Laurel, Milford, Seaford, and St. Thomas More. May—The Vikings continue their winning streak with another victory over Smyrna, and also appear in the state rankings for the first time. They then enjoy a win over Sussex Central, but lose by a single stroke to Sussex Tech at The Rookery. The team finishes its regular season with a win over Polytech and a rare forfeit victory over Hodgson. They take seventh place in the state tournament, and several players win all-conference honors. June—Over 90 juniors play the Rehoboth Beach Invitational, a good sign of growing young golfer interest throughout the state. Friends and family fondly remember Walt Wagamon for his love of the game. July—Tempers can flair on the golf course, with unintentionally amusing results. Pete Oakley is in the middle of his European Senior Tour season, and doing well. I note the tenth anniversary of Hole By Hole, which led to this column’s creation. August—A severe thunderstorm alters the Cape Region golf landscape. Local golf pros suggest ways to pick the perfect putter. Switching to a ten-finger grip can ease the painful effects of arthritis. September—Running a golf cart into a stream does not make the cell phone happy. The long golf league season reminds players of bowling. Four generations of the Kardash family golf together for the first time. October—My mother’s passing brings up golfing memories. Mike Connor’s hole-in-one earns some serious ribbing from his fellow golf pros. A mostly new batch of fake golf laws should produce a few good grins. November— The USGA and R&A announce major new changes to the Rules of Golf. Kevin Wiest, the new golf pro for Kings Creek, sits down long enough for an interview. I enjoy playing Baywood Greens for the first time. 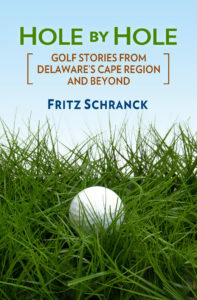 December—Holiday gift ideas are readily found at Cape Region golf outlets and pro shops. However, once again there are several Christmas golf gifts to avoid, despite their easy availability on the web.